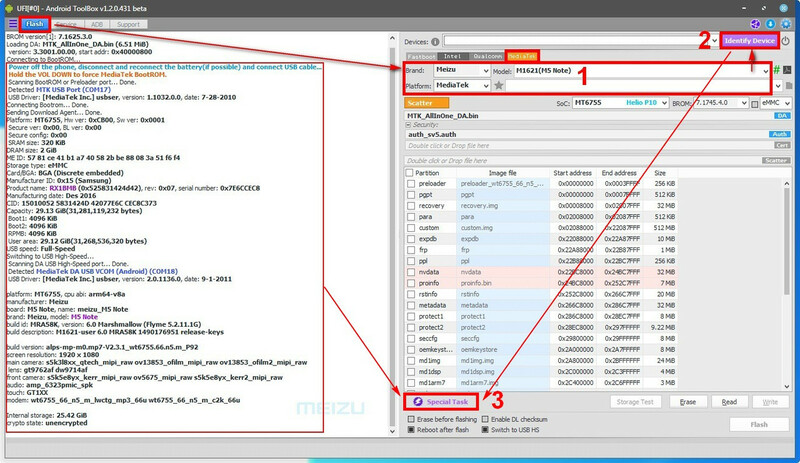 Just for you who do not know how to use [Meizu] Reset Flyme Account feature using UFi Android Tool Box. 1. Identify Devices "at First. Always Choose Brand, Model, Platform, and Firmware according to your Device you are working on. Position the device into BootROM mode when "Identify" by pressing the volume down button before the device is connected via USB cable. Specific features for certain brands and models are stored in this button, and will only be active when Identify Devices is successfully executed. Like for example [Meizu] Reset Flyme Account . Make sure the feature has been successfully executed by taking into account the specific task that we have selected in the Special Task menu. and seen in The Log window has been successfully performed by the software. meizu pro7-s Reset Flyme Account not work?? ?help me!!!! Hold the VOL DOWN to force MediaTek BootROM. Scanning BootROM or Preloader port... Done. Scanning DA USB High-Speed port... Done. 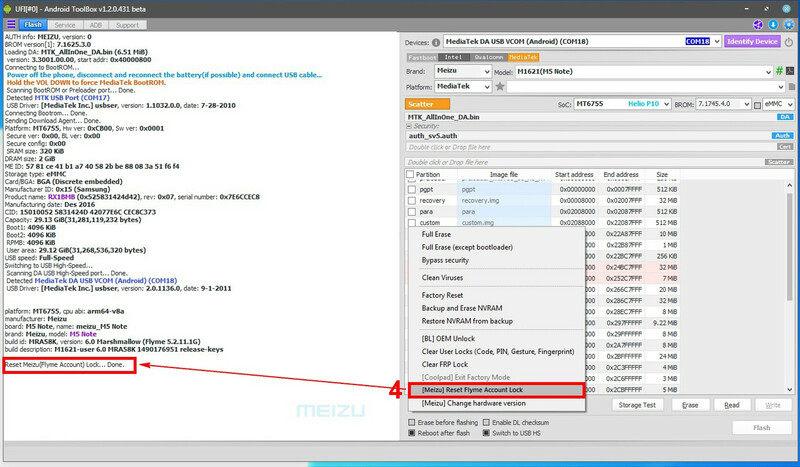 Reset Meizu(Flyme Account) Lock... Done. To completely reset the locked message, you may have to erase NV data and rewrite the imei. liliu same problem bro,no answer from support for a few month. AleksandrPopov Hello, you can try another methode shared by @p4ndahp3 here. i know this methode,it's not working. and how to change proinfo without root,also ufi can't flash proinfo via mtk port always error. and i want to ask you,did you check this methode by yourself? i bought ufi dongle only for that meizu phones ,to unlock that accounts,but it's not supported . i know another methode ,and i can try it if you give me AUTH and DA files ,or drop it on support please.